Preparation time: 30 minutes. Cooking time: 15 minutes. Baking time: approximately 1 hour. Place whole peppers in a large pot and cover with water. Place a lid on the pan and bring to a boil over high heat. Boil until peppers just begin to soften, about 3–5 minutes. Drain well. Fill pan with cold water to cover peppers, then drain again. Repeat. Peppers should be cool enough to handle; if not, allow them to stand several minutes in the cold water, then drain well. Cut a lengthwise slit in one side of each pepper, but don’t remove the stem (use caution, as the inside of the pepper may still be warm). Carefully remove pepper seeds by squeezing them off the core and discard. Rinse insides of peppers and turn them cut side down on a paper towel to drain. Preheat oven to 350°F. Brown ground round in a large, nonstick skillet over medium-high heat. Drain well, stir in frozen corn, and set aside to cool (about 5 minutes). Stir in tomato, salt, pepper, basil, and cumin, mixing well. Sprinkle bread crumbs over meat mixture. Add egg substitute and stir to mix well. Pack meat mixture into each pepper with hands, packing full, and place peppers in a 9″ x 13″ baking dish coated with cooking spray. Cover with a lid or foil and bake for about 1 hour, or until heated through and onions are tender and translucent. 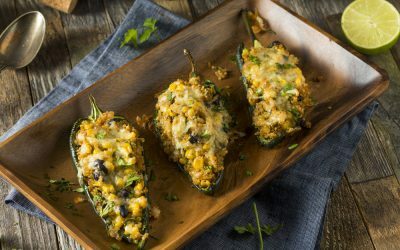 Uncover peppers, sprinkle evenly with cheese, and return to the oven uncovered for 2&ndash”3 minutes, or until cheese melts. Exchanges per serving: 1 starch, 1 non-starchy vegetable, 2 lean meat. Carbohydrate choices: 2.